Ammonia Poisoning is the accidental or intentional intake (swallowing, breathing-in, or skin contact) of any product containing the compound. What are the Causes of Ammonia Poisoning? What are the Signs and Symptoms of Ammonia Poisoning? The signs and symptoms of Ammonia Poisoning can vary from one individual to another. It may be mild in some and severe in others. Several systems of the body, such as the vascular system, digestive system, respiratory system, and ENT may be affected. How is First Aid administered for Ammonia Poisoning? Who should administer First Aid for Ammonia Poisoning? 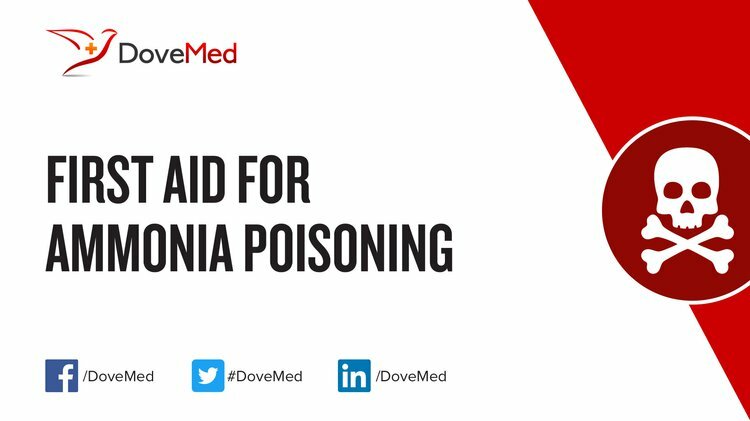 First aid for Ammonia Poisoning is administered by healthcare professionals. What is the Prognosis of Ammonia Poisoning? How can Ammonia Poisoning be Prevented? Werner, T., & Büttner, H. (2014). Phosphorus‐based Bifunctional Organocatalysts for the Addition of Carbon Dioxide and Epoxides. ChemSusChem, 7(12), 3268-3271. Kosenko, E. A., & Kaminsky, Y. G. (2010). Activation of AMP deaminase and adenosine deaminase in the liver during ammonia poisoning and hepatitis. Bulletin of experimental biology and medicine, 150(1), 36-38. Li, J., Zhu, R., Cheng, Y., Lambert, C. K., & Yang, R. T. (2010). Mechanism of propene poisoning on Fe-ZSM-5 for selective catalytic reduction of NO x with ammonia. Environmental science & technology, 44(5), 1799-1805. Ye, Q., Wang, L., & Yang, R. T. (2012). Activity, propene poisoning resistance and hydrothermal stability of copper exchanged chabazite-like zeolite catalysts for SCR of NO with ammonia in comparison to Cu/ZSM-5. Applied Catalysis A: General, 427, 24-34. Wang, L., Zhao, Y., Liu, C., Gong, W., & Guo, H. (2013). Plasma driven ammonia decomposition on a Fe-catalyst: eliminating surface nitrogen poisoning. Chemical Communications, 49(36), 3787-3789. YANG, B., MA, Y., ZHANG, W. D., XU, R., YIN, F., CHEN, Y. B., & LIU, S. Q. (2011). Experimental study of co-fermentation of tiger dung with elephant dung for biogas production. Journal of Yunnan Normal University (Natural Sciences Edition), 6, 006. Fauziah, S. H., Izzati, M. N., & Agamuthu, P. (2013). Toxicity on Anabas Testudineus: a case study of sanitary landfill leachate. Procedia Environmental Sciences, 18, 14-19. Pendyala, V. R. R., Gnanamani, M. K., Jacobs, G., Ma, W., Shafer, W. D., & Davis, B. H. (2013). Fischer–Tropsch synthesis: effect of ammonia impurities in syngas feed over a cobalt/alumina catalyst. Applied Catalysis A: General, 468, 38-43.